The Eastern turkey range stretches from the Great Lakes in the north to the Mexico Bay in the south, and from Atlantic coast in the East to Kansas, Oklahoma, Nebraska and Texas in the west. It has also been successfully introduced to some of the Western states. You can find an eastern turkey hunt at under $500, but most outfitters will charge you about $1,000 for a spring hunt with decent chances to get a gobbler. Licenses and regulations vary from state to state, but the default situation is this: shotguns and archery, voice and box calls, blinds and decoys are OK. Hunting over bait, with rifles, at roost sites, with dogs, and with artificial (electronic) calls is forbidden. Only bearded birds are legal during spring season, and often in the fall season too. In most locations turkeys are abundant enough to offer over-the-counter tags, and the average seasonal limit is two birds (although it can be as high as four in some areas). When to hunt Eastern Turkey? With hunting season for eastern turkey open in over 30 states, it’s hard to generalize. Spring seasons start in mid to late March at the southern part of the range, and may continue until late May near the Canadian border, with most opportunities somewhere in between. Fall season typically starts in September and may go on until December or even January of the next year. Eastern turkey is often considered the second hardest turkey to bag after Osceola turkey. It is supposed that centuries of hunting pressure made the eastern turkey more wary and careful than other varieties. Eastern turkey is the creature of a forest (although it may adapt to more open land if appropriate roost sites are available), which adds to the problem, as it’s almost impossible to visually spot them. 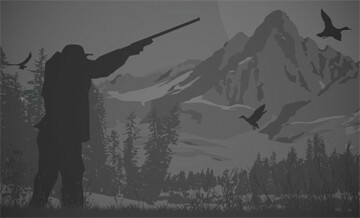 Good knowledge of roost sites, and general layout of the woods, along with expert calling techniques, is required for success. The best way to jump-start your turkey hunter’s career is to hire a professional outfitter or guide. The Eastern turkey is the most widely distributed subspecies of turkey in America. It is also the biggest of the American turkeys, with birds in the Midswest sometimes tipping the scales at 30 pounds. It has long beard and spurs, and highly characteristic black-and-white feathers that make a unique color pattern when the bird’s wings are closed. This is the original turkey that first settlers encountered, and the one that Ben Franklin wrote about in the famous letter where he suggested the turkey might make a better national symbol than the bald eagle, so to hunt Eastern turkey is to continue the American hunting tradition.